I had to think hard before including this review under the "Inspiration" section as the book could equally fit under other classifications. In the end I decided on "Inspiration" as the book is quite inspirational and the instruction element is quite reserved. 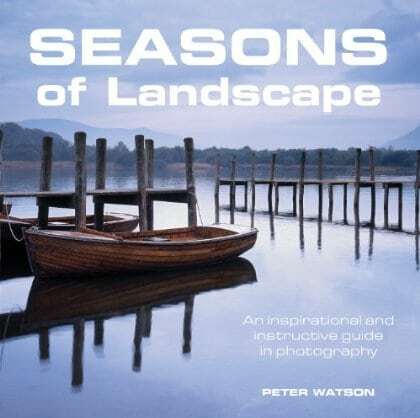 This is a book about photographing the Landscape by a very experienced and accomplished photographer. Peter's work is though quite different from that of many of the photographs you come across today; I can best describe it as being quite simple and understated. I have heard some people refer to this style as boring because it doesn't immediately hit. Such comments are very much an injustice as you need to invest time to appreciate such beautiful images. The pictures don't shout look at me but rather allows you to reflect and become drawn in. It's this simplicity that I find so attractive and which shows the mark of an accomplished professional. The book is laid out into 12 chapters, each covering a different month of the year and each well illustrated. The images are accompanied by a discussion of how the photography changes as the months change. On first read you might miss the information in the text but if you spend time contemplating the text, re-reading each page and reviewing the images, techniques begin to reveal themselves to you. This is not a read it once book full of instruction but it is packed with good advice. What I didn't like in the book was the introduction which touches briefly on equipment and to my mind is neither useful nor called for in a book of this calibre. Otherwise this is very well put together book and an enjoyable and informative read.